Now that we learned from my earlier post that some human foods are quite good for dogs, let’s look at what’s bad for dogs. Many of these you may know, but let’s see why they’re so horrible and what you can expect to happen if your dog ingests these foods. Let’s gather these bad human foods for dogs and keep them safely sealed up in the cupboard out of Fido’s reach! Chocolate, Coffee, and Caffeine: Caffeine isn’t all that good for kids, and it’s even worse for dogs! Methylxanthine, which you find in cacao seeds, coffee plants, and in the nuts of an extract used in sodas, can really mess up your dog: it can cause vomiting, diarrhea, hyperactivity, abnormal heart rhythm, tremors, seizures, excessive thirst and urination, and even death. Darker chocolate, being more concentrated in the stuff, is more dangerous than milk chocolate, while white chocolate has the lowest level of methylxanthines. While baking, chocolate contains the highest amount, so don’t you share those yummy chocolate chip cookies with Fido! Onions, Garlic, and Chives: Although some veggies are good for your dog, these three veggies aren’t as they can cause GI irritation and red blood cell damage. You can find garlic in some dog foods, vitamins, and treats, and is sometimes used as a topping to entice a picky dog to eat his meals, but this is only safe if given in teeny tiny amounts. 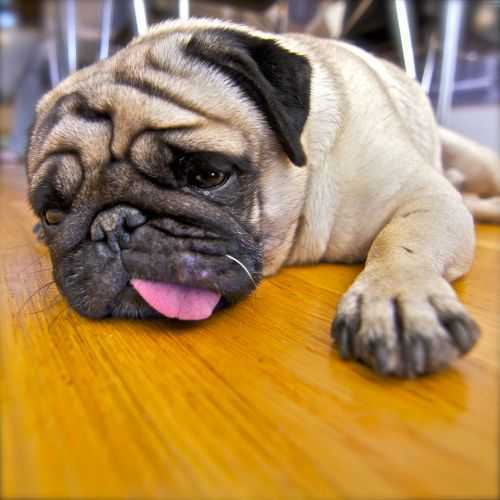 Too much can make your dog very sick and very unhappy. Don’t give ANY to your cat though, for the results are even more dramatic. Although many people like to feed their dogs baby food as a treat, this contains onion powder and isn’t a good idea. Grapes and Raisins: Being one of the more common foods in your home, it’s important to know that grapes and raisins are horrible for your dog! People aren’t sure what the toxic substance is, but these fruits can cause kidney failure in dogs. If your dog already has health problems, signs may be even more dramatic. Raw Meat, Eggs, and Bones: Even though wolves and stray dogs can eat raw meat, your dog really shouldn’t. Raw meat and raw eggs can contain Salmonella or E. coli that can be harmful to pets. Raw eggs also contain Avidin that decreases the absorption of Biotin (Vitamin B), which can lead to skin and coat problems. Feeding your pet raw bones isn’t a good idea either for your dog, no matter how smart he is, can choke or splinter the bone and it can become lodged in or puncture your pet’s digestive tract. That’s a very big vet bill for a very small treat. Raw Fish: Although cooked fish is great for your dog, raw fish can result in a Thiamine (Vitamin B) deficiency. This leads to loss of appetite, seizures, and even death. Don’t share your sushi! Avocado: The leaves, fruit, seeds and bark of avocados contain Persin, which can cause vomiting and diarrhea in dogs. In very tiny amounts, it can be a nice way to keep the skin and coat healthy, but unless your dog’s getting his avocado fix from Avoderm Dog Food, try to resist sharing any avocados with him. Macadamia Nuts: These nuts are sometimes used in cookies and candies, and can cause problems for your dog such as weakness, depression, vomiting, tremors, and hyperthermia. If you suspect Fido stole some cookies from the cookie jar, be aware that symptoms usually appear within 12 hours of ingestion, and last about 12 to 48 hours. Yeast Dough: Although dogs can eat small amounts of bread since the dough has already fully risen, uncooked yeast dough can rise and cause gas to accumulate in your pet’s digestive system, resulting in his intestines to rupture! It’s not pretty, so bake his treats before you plan to give some to your dog if it contains yeast dough. Milk: Dogs are lactose intolerant because they don’t possess enough lactase in their body, so milk and other milk-based products cause diarrhea or other digestive upset. Teeny tiny amounts can be okay, but be careful or else your carpets will hate you forever. Salt: Too much of this can cause excessive thirst and urination, or even sodium ion poisoning. Symptoms include vomiting, diarrhea, depression, tremors, elevated body temperature, seizures, and even death. It’s a given that feeding your dog those yummy potato chips isn’t a good idea then. Alcohol: It’s not great for humans, but like caffeine, alcoholic beverages and food products containing alcohol result in even worse symptoms for dogs. It can cause vomiting, diarrhea, decreased coordination, central nervous system depression, difficulty breathing, tremors, abnormal blood acidity, coma, and even death. If you’re having a party, make sure no one decides to be generous and share a glass with your dog. Xylitol: A sweetener used in gum, candy, baked goods, and toothpaste, Xylitol can lead to liver failure in dogs. It causes an insulin release in many animals that leads to hypoglycemia (lowered sugar levels), and results in vomiting, lethargy, seizures, and loss of coordination. If you want to brush your dog’s teeth, please make sure to use dog tooth paste available in pet stores and not human tooth paste! Cat Food: Of course, this food is designed to be fed to your cat, not your dog. Cat food contains a lot protein and fat; way more than your dog needs. If your dog has a cat friend, try to make sure they don’t share meals. One interesting thing I’d like to mention is that dogs can eat cat treats, but cats can’t eat dog treats. Cat treats are much cheaper overall, so take advantage of this knowledge! But be aware that like their food, cat treats contain a large amount of protein, so feed these smelly fishy treats sparingly. Marijuana: Although some people might think this would be great for a hyper or nervous dog, this can depress the nervous system, cause vomiting, and dramatic changes in heart rate. Your dog will not become chill after eating or smelling this! And those are the many human foods that are no good for your dog. Sure, some of these things aren’t foods, but for the average dog, anything that fits in its mouth is considered food. Be sure to keep these things far from your dog’s reach, and if enjoyed by yourself, stay greedy and don’t share any with your dog. Instead, offer a snack from the Good Human Foods for Dogs list! Categories: food | Tags: bad, diet, dog, food, health, safety | Permalink.